Our Autumn amber brew with the unmistakable flavor of “pumpkin pie” is available now through Thanksgiving in 12 oz bottles and seasonal draft. This was a gift from my friend Gonzalo. 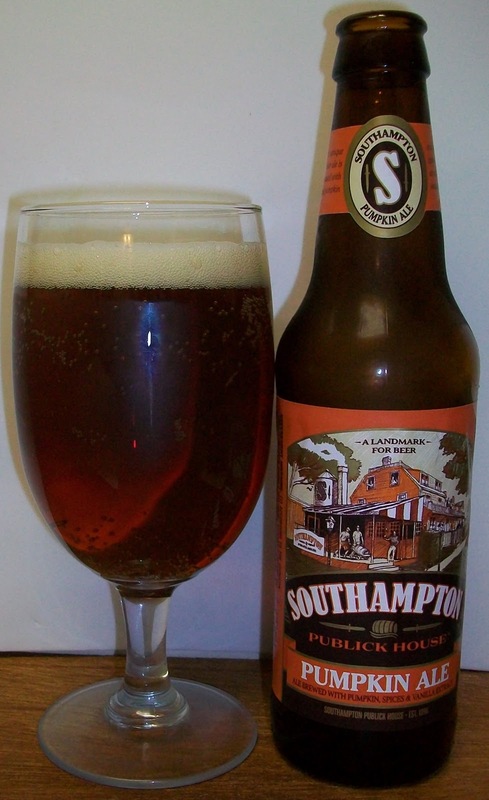 I have had a lot of good beers from Southampton but I have not had their pumpkin ale yet. I’m really looking forward to this. The beer pours a clear amber with orange hues and a modest off white head. The nose has some caramel malt aromas but it is mostly pumpkin spice. Not a bad first sip. I was expecting it to be mostly spice but this as some nice pumpkin flavor to it as well. It starts out with a light sweetness up front followed by a effervescence over the tongue in the middle of the sip. The back-end is very easy drinking with an almost effortless swallow. There is also a carbonation release during the swallow that adds a refreshing quality to the experience and masks some of the flavors. The finish is very nice with caramel malt flavors along with floral hops, real pumpkin flavor and of course a good dose of pumpkin spices. The final aftertaste is of a lingering pumpkin spice. All and all this is a very nice pumpkin ale. It really does have some nice pumpkin flavor along with the spicy notes. I’m going for a B on this one. 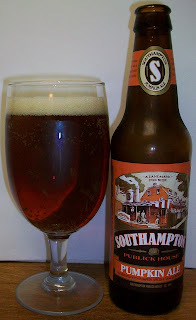 This beer has a good pumpkin flavor along with nice caramel malts and pumpkin spice.